Bronco is a North American Top Hat, so completely different style and very little to do with global products center ATM. Rumor is that it will be first vehicle on next gen architecture where Ranger is last on original architecture. 2b2, Logans Run and HotRod like this. I am seriously excited for the Bronco. Ford laid out future plans to Car and Driver and other assembled journalists in Dearborn, Michigan, today, with news touching on several upcoming performance and off-road-capable vehicles. Among the several teasers released at the briefing was the first look—sorta—at the upcoming Ford Bronco and a surprise announcement of a second, smaller adventure vehicle. And guess what? Judging by the shapes under a dirty sheet, the Bronco looks quite boxy and nothing like the global Ford Everest it has been rumored to be based on. The backgrounder provided small insights on numerous rides, including the Mustang GT500, the Explorer ST, and the Mach 1, yet the outline of the Bronco might have stolen the event. Creases in the sheet show an extremely boxy shape with a long squared-off hood, a blunt nose, an upright windshield, and a rectangular greenhouse. It also shows bulging fender flares and a rear-mounted external spare tire. It is still possible the underpinnings of the Bronco could be sourced from the Everest, but this pretty much eliminates any speculation that it will simply be a warmed-over version of that SUV, which is sold outside the United States. We expect the Bronco to have a body-on-frame setup and to share platforms and powertrains with the new Ranger pickup. There is also speculation that the Bronco will be offered in both two-door and four-door variants that would directly compete with the Jeep Wrangler; based on its wheelbase, the vehicle in the teaser is what we believe to be the two-door variant, while a four-door variant would be necessary to realize profitable sales volumes. Furthermore, Ford showed the above image of a “yet-to-be-named off-road small utility.” Details on this one are scant. It looks to be the size of the Escape; we do know, however, that it isn’t the next Escape. As seen in this image, it has meaty fender flares, an aggressive-looking front fascia with a downsized version of the FORD logo seen on the F-150 Raptor, a muscular hood, roof rails, and a generally boxy shape with rounded edges. 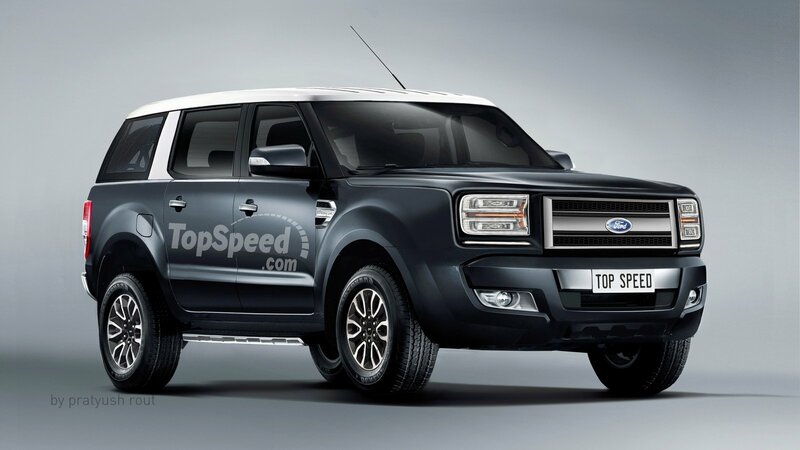 We should know more details on the Bronco and its smaller SUV sibling, as well as the rest of Ford’s upcoming releases, in the next few months. There's a twist I didn't see coming! Last edited by HotRod; 03-15-2018 at 04:48 PM. Does anyone else think that looks more like a two-door and not a four-door? Last edited by Bellanca4.2; 03-15-2018 at 04:58 PM.